Explore in Sheets, powered by machine intelligence, helps teams gain insights from data, instantly. Simply ask questions—in words, not formulas—to quickly analyze your data. For example, you can ask “what is the distribution of products sold?” or “what are average sales on Sundays?” and Explore will help you find the answers. Now, we’re using the same powerful technology in Explore to make visualizing data even more effortless. If you don’t see the chart you need, just ask. Instead of manually building charts, ask Explore to do it by typing in “histogram of 2017 customer ratings” or “bar chart for ice cream sales.” Less time spent building charts means more time acting on new insights. Whether you’re preparing a client presentation or sharing sales forecasts, keeping data up-to-date can be time-consuming, especially if you need to update charts or tables in multiple sources. This is why we made it easier to programmatically update charts in Docs and Slides last year. Now, we’re making it simple to keep tables updated, too. Just copy and paste data from Sheets to Docs or Slides and tap the “update” button to sync your data. Upgraded printing experience: Preview Sheet data in today’s new print interface. Adjust margins, select scale and alignment options or repeat frozen rows and columns before you print your work. Powerful new chart editing experience: Create and edit charts in a new, improved sidebar. Choose from custom colors in charts or add additional trendlines to model data. You can also create more chart types, like 3D charts. This is now also available for iPhones and iPads. Increased support for charts in the Sheets API: Use the API to programmatically generate most charts with support for dozens of new operations. These new features in Sheets are rolling out starting today. 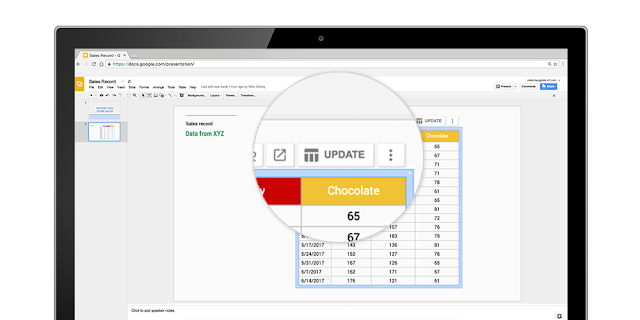 Learn how Sheets can help you find valuable insights. One last thing—so that we can focus our efforts on the improvements to charts outlined above, we’re also deprecating one of the lesser-used chart types: the Motion chart. Beginning in July 2017, you will no longer be able to insert or create Motion charts, and, in September 2017, you will no longer be able to edit them. No earlier than December 2017, any Motion charts still in Sheets will become static images and no longer update when their corresponding data changes. We recommend trying Bubble charts instead. Sorting through rows and rows of data in a spreadsheet can be overwhelming. That’s why today, we’re rolling out new features in Sheets that make it even easier for you to visualize and share your data, and find insights your teams can act on.